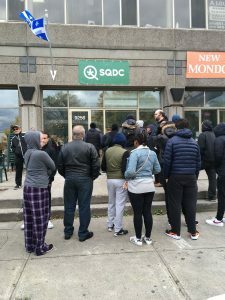 On Legalization Day at 10:00 am, three outlets of the government-run Société Québécoise du Cannabis (SQDC) opened their doors in Montreal, out of twelve across the province—one located in the suburb of Ahuntsic-Cartierville, across from big-box park Marché Centrale; one located downtown on Ste-Catherine and Mansfield; and one in the former Plaza Saint-Hubert. I visited all three to meet the people who braved chilly weather and a strong wind to buy Canada’s first legal recreational cannabis. 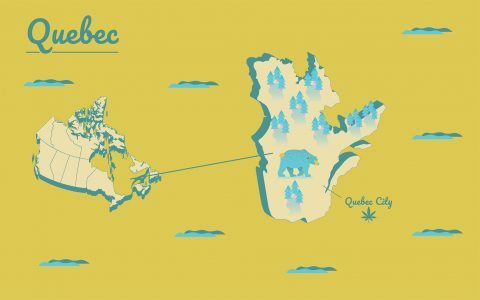 The hardest Montreal SQDC to get to if you’re not from the area and using public transportation was also the least pleasant to wait at, due to the wind-tunnel effect of nearby buildings funneling the day’s cold and gusty wind directly at those waiting under heavy layers of clothing. But it was also the shortest wait of the day, at roughly three hours. The character of the crowd showed early when Adam, a 24-year-old student who uses a walker because of reduced mobility, arrived. The front of the line opened up and everyone agreed to allow him to cut in and reduce his time on his feet. The real action of the day was at the SQDC’s downtown location, on Sainte-Catherine, by Dominion Square. When I arrived there around 2:00 pm, the line was rounding the corner of Metcalfe Street and stretching two blocks toward René-Levesque Boulevard. Media trucks were lined up in front of the store, where the atmosphere was celebratory. Retiree Cathy, 61, was in line with her son. She started using cannabis at 15, though she never used very much, but it made her into a lifetime cannabis users. Legalization was a big deal for her. She didn’t plan her strain choices in advance and said she’d leave it up to her son to pick something out for her. Thomas, 27, is an expert—and a black-market cannabis dealer. His plan was to buy the highest quality he could find to compare it with the premium cannabis he sources illegally. Tim, a 19-year-old construction worker, and Yann, a 29-year-old graphic design student, waited side by side. They agreed the line was longer than they’d hoped—when I spoke to them they were in striking distance of the door, and had been waiting more than four and a half hours. Shortages were beginning to emerge. 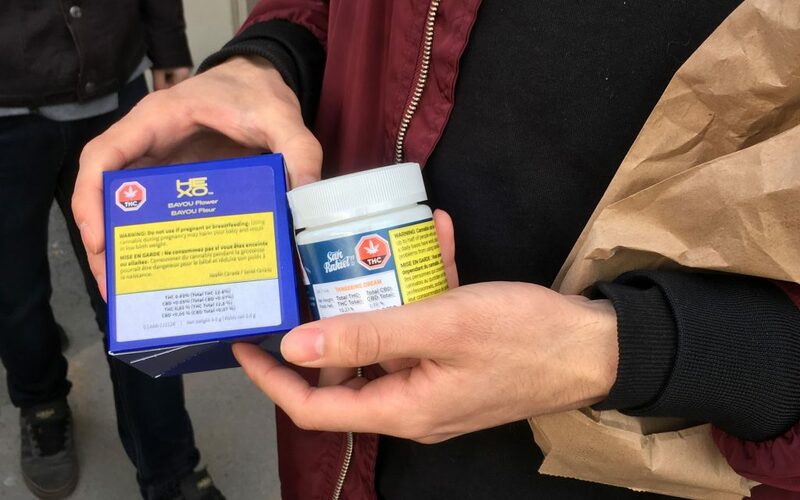 Kay, a 21-year-old sociology student at Concordia, had planned on buying Hexo’s proprietary Northern Lights strain Azul, but saw the last products sold just as he reached the counter. He got Soleil’s Harmonzer and Hexo’s Sierra instead. 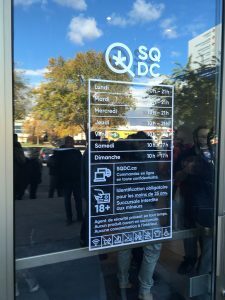 The third SQDC offered a four-hour line running the length of the former Plaza Saint-Hubert, which is currently under serious construction. While those waiting for the SQDC were sheltered from the wind, there was no protection against the noise of jackhammers. The crowd had a critical mass of young men in their twenties, but beyond that represented people of seemingly every age and ethnicity. 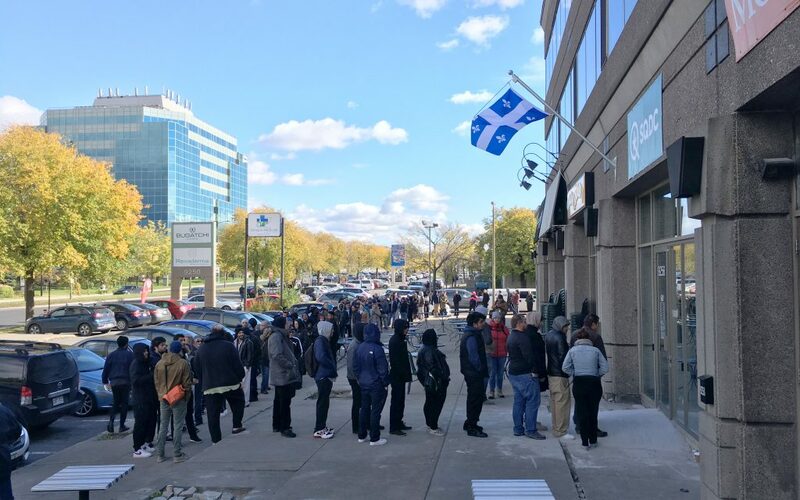 One difference at the Saint-Hubert location was the presence of union organizers with a large flag at the front of the line. 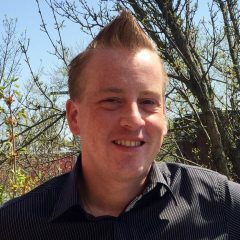 Charles-David Emery of union the Confédération des Syndicats Nationaux told me, in French, that the SQDC, though it’s an offshoot of provincial liquor board the Société des Alcools du Québec and a state business, is a new and independent business, so its employees are not unionized. He was hoping to bring them onboard. Gabriel, a 20-year-old bar employee about to return to schooling as a pastry chef, first tried lining up at the Ste-Catherine Street location downtown. For Gabriel, the helpfulness of the staff was what impressed him the most—he was happy to have them explaining everything from the outset and helping him find strains that would meet his needs. He also approved of the approach of grading cannabis by strength, from mild to strong. Street outreach worker Emmanuelle, 55, was the rare character in the SQDC line who’d virtually never used cannabis, beyond a couple of puffs in her youth. However, she was not happy that the stores check government-issue ID, since many homeless people have none. As well, she was indignant about the possibility the CAQ government would ban smoking cannabis in public, effectively re-criminalizing it for homeless people. She hadn’t intended to come out, but the SQDC website wouldn’t accept her credit card. As of this writing, the SQDC adventure is over. 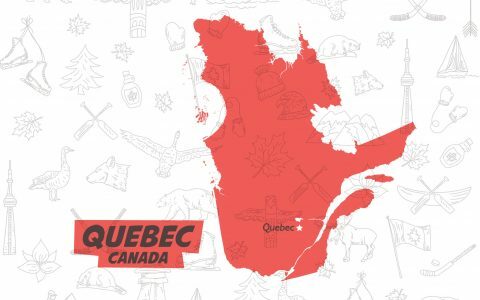 Unlike Newfoundland, which will allow its cannabis stores to remain open to 2 a.m., the government of Quebec mandates SQDC outlets close at 9:00 pm.